Tickets to "Late Night With Seth Meyers"
Seth Meyers began hosting Late Night With Seth Meyers on February 24, 2014, replacing Jimmy Fallon who is now hosting The Tonight Show Starring Jimmy Fallon. This is great news because now you can see both shows taped live in New York City when you visit—if you know how to get tickets! Here's all the information you need to know to get tickets to see Late Night with Seth Meyers, including how to get advance tickets, standby tickets and even how to see Seth rehearse his monologue! Late Night with Seth Meyers tickets are available online. Tickets are generally released a month at a time at the beginning of the prior month (i.e. they will open up all tickets for April at the beginning of March). They release tickets in blocks, so check frequently to see what tickets are currently available. There is a four-ticket limit per request and you're only allowed to attend a taping once every six months. Stand-by tickets are distributed on the same day as the show tapes. The line-up for tickets outside the Harry Potter window near the plaza on the 49th Street side of 30 Rockefeller Plaza. They begin distributing one ticket per person at 9 a.m. If there are any standby tickets leftover, they will be available at The Shop at NBC Studios on 49th between 5th and 6th Avenues. Stand-by tickets for Late Night with Seth Meyers do not guarantee admission. Call the ticket hotline (212-664-3056) to be sure that the show is taping that day. Tickets are distributed at 12:30 p.m. daily at The Shop at NBC Studios located at 30 Rockefeller Center (49th St. between 5th & 6th Avenues) for the same-day monologue rehearsal. You'll need to line-up at 3:45 for the monologue rehearsal. Tickets are only available for groups of less than 10 people. If you want to try standby for the monologue rehearsal, line up on the Mezzanine level of 30 Rock at 3:45 p.m. to see if there are extra tickets available. If you have tickets for the regular show that day, you can't attend the monologue -- if you have standby tickets for the show, you can attend the monologue. 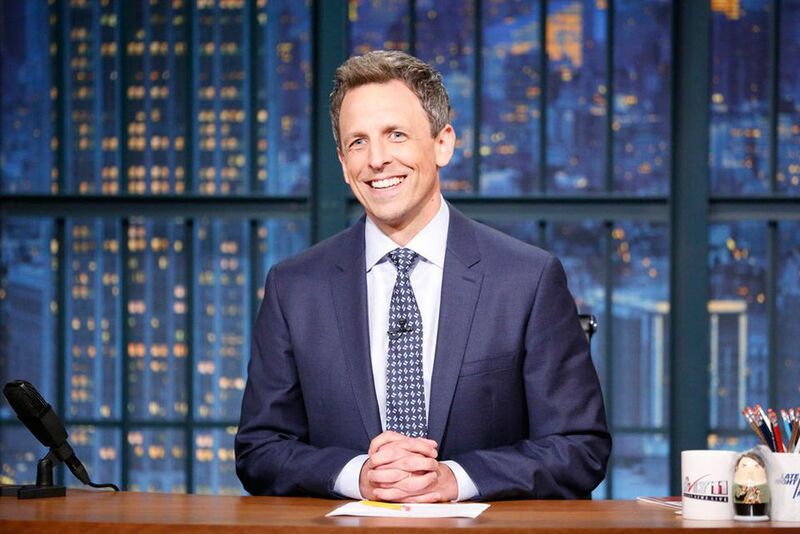 Late Night with Seth Meyers typically tapes on Monday through Thursday. Late Night with Seth Meyers tapes at 6:30 p.m., but check-in is from 4:30- 5:15 p.m.
Large packages, shopping bags, suitcases, etc. are not permitted in the studio, so make sure to drop off your belongings at your hotel before you arrive. Bring a sweater or jacket if you're attending a taping -- they keep the studios pumped full of refrigerated air. You might want to check out the NBC Studios Tour, depending on the day of the week and the time of day, you might get a chance to see inside the Late Night studio.